Airbus Helicopters at IndoDefence 2014 with a full range of military and security helicopters. The highly fruitful Airbus Helicopters relationship with Indonesia takes center stage at Indo Defence 2014, where this long-term cooperation’s advantages for Indonesian military services, parapublic operators and industry will be highlighted at the exposition in Jakarta. Visit Airbus Helicopters during Indo Defence 2014 at Hall D, exhibit stand D043. During the 5-8 November event, Airbus Helicopters’ exhibit is to focus on its beneficial relationship with PT Dirgantara Indonesia/Indonesian Aerospace, which has grown to include the in-country production of components and aerostructures, licensed assembly, mission equipment outfitting and completion. 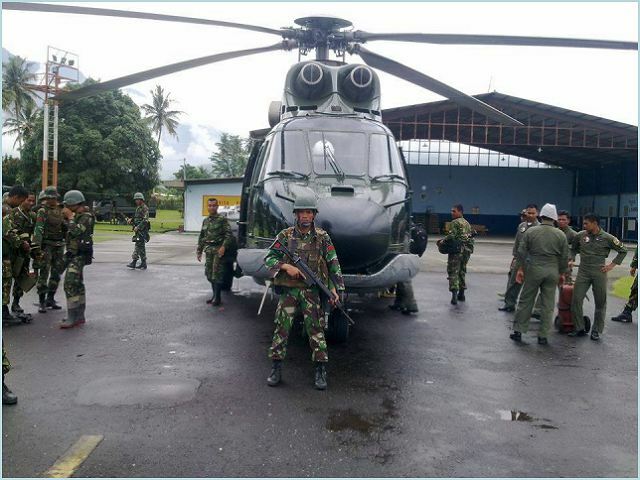 Also to be highlighted is the country’s growing fleet of Airbus Helicopters rotorcraft for the Indonesian Army, Navy, Air Force and the Basarnas national search and rescue agency which spans the company’s light, medium and heavy product lines. Indonesia’s military inventory – which today includes Airbus Helicopters’ EC120 Colibri, AS330 Puma, AS332 Super Puma, and the legacy BO105 – is being further strengthened with the 2014 delivery startup of 12 rotorcraft from the Ecureuil/Fennec family, comprising six single-engine and six twin-engine versions for attack missions; along with six EC725s that will soon be delivered for the Indonesian Air Force’s search and rescue duties. In the public services sector, national search and rescue agency, Basarnas, has been operating two units of the AS365 N3 Dauphins for a year now. PT Dirgantara Indonesia has been handling the sales responsibilities of Airbus Helicopters rotorcraft in the country and performing mission equipment installation and customization at its facilities in Bandung.